Experience the 150th anniversary of the Civil War at Windsor’s American Precision Museum with Howard Coffin, Vermont’s foremost Civil War historian and author. Howard Coffin will talk about the Vermont brigade, which was the only Union brigade made up of regiments from a single state that served throughout the war. And they were the best! This is their story. October 26, 2013, 8:30 am – 3 pm. Howard Coffin will be the featured speaker at a conference on “Vermont in the Civil War: 1863″ to be held at the Saint Albans Historical Museum on . The conference registration is at 8:30am and the start time is 9am. The day-long event, organized by the Vermont Academy of the Arts and Sciences (VAAS), will bring together nationally-known scholars, Civil War buffs and local experts. “It is an event for the whole family,” said VAAS President Connell Gallagher. “In addition to attending presentations about Vermont during the Civil War and St. Albans at that time, people will also have a chance to learn about the oldest standing RC church in Vermont and hear an organ recital at the Church of the Immaculate Conception. There will be guided historical tours of St. Albans and of the Museum,” he added. Howard Coffin will focus on 1863, the year of the passage of the Emancipation Proclamation and of the Battle of Gettysburg. He will place Vermont’s participation in the war within this framework. This well-respected historian, whose ancestors served in Vermont Civil War regiments, is the author of numerous books including Full Duty: Vermonters in the Civil War (1993) and Something Abides: Discovering the Civil War in Today’s Vermont (2013). Coffin’s talk is co-sponsored by the Vermont Humanities Council. Sunday June 30th, Howard Coffin spoke at the Gettysburg Visitor’s Center at the Gettysburg National Military Park Museum and Visitor Center in Gettysburg, PA about the Vermont Attack on Pickett’s Charge. The talk was followed by a Book Signing in the Visitor Center Lobby at 2:30 pm. Watch C-SPAN coverage of the events on C-SPAN3. Thursday, July 4th, Howard Coffin spoke at the Calvin Coolidge Museum & Education Center during the Calvin Coolidge birthday celebration. 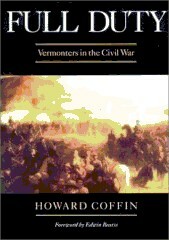 Saturday, July 27th, Howard Coffin spoke at the Bookstock Literary Festival in Woodstock, VT. Howard will discuss Something Abides: Vermont Civil War Stories and Places. The book lists more than 3,000 Civil War sites that survive throughout the state. With this book, the reader can recreate what Vermont was like 150 years ago.